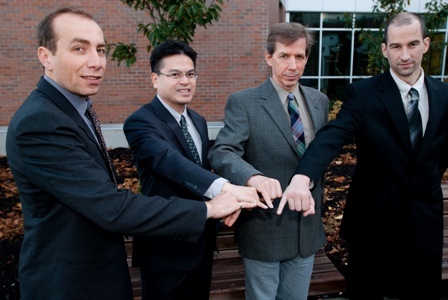 The iron ring is an incredibly important symbol for every engineer in Canada. It is worn to remind engineers of the obligation that they have to follow ethical standards as professionals in the field. The concept of the iron ring dates back to 1922 and this little symbol has huge emotional significance for just about every engineer in the country. Made of either wrought iron or stainless steel, the ring is given during a special ceremony that most engineers remember for a lifetime. What happens, however, if the iron ring is accidentally lost or damaged? Each university in the country has a specific procedure for the replacement of alumni iron rings. University of Toronto graduates will simply need to complete a form on the university’s website for the ring replacement to be initialized. Anyone who’s interested in a replacement will need to have information about their ring size before filling out the form. The replacement fee for the new iron ring is 30 dollars and if an individual aged 80 or older has lost the ring, the new one will be created free of charge. Anyone who has completed the program from another country and hasn’t participated in an Obligation Ceremony will need to go through one in order to get an iron ring. An application has to be sent between November 1 and January 31 for the candidate to get an invitation to the ceremony. Engineers that have graduated from a Concordia University program can also benefit from a simple opportunity for getting a replacement iron ring or receiving a ring in a different size. One of the easiest options for getting the replacement is scheduling a personal appointment. Am email will have to be sent to ironring@encs.concordia.ca for the appointment to be made. An online form is also available for the individuals that need a remote replacement. The information that will be needed for the replacement ring to be received includes the engineer’s obligation certificate, a picture ID and a ring size. The fee for the manufacturing of a new iron ring is 20 dollars. Once again, an online form will need to be filled out for a ring replacement. If you’re a graduate, you’ll need to provide information about the material that you’d like the new ring to be made of (stainless steel or iron), your ring size, the shipping address and obligation certificate. The cost of a lost ring replacement is 30 dollars and this amount includes the shipping charges. The payment can be completed using a credit card. All individuals over the age of 80 can get a replacement ring free of charge. Engineers that have graduated from a University of Waterloo program can get their replacement ring at reunions or by mail. A letter will need to be sent to the university address and it should include information about year of graduation, specialization field, ring size (in case it’s different from the original), return address and phone number. The cost of having a replacement manufactured is 35 dollars. When the ring is ordered by mail, it will be delivered in approximately three to four weeks after the request is received. An online request will once again have to be made for a graduate to receive a replacement iron ring. Alternatively, a graduate can visit the university campus to have the procedure completed. The cost of the replacement is 30 dollars and engineers can decide to pay either by credit card, cash or cheque (depending on the replacement method that has been chosen). The replacement ring will be sent in approximately seven to 10 days after the application is received. Carleton University graduates can send an email to camp12@ironring.ca in order to have their iron ring replaced. The email will once again have to include information about address, year of graduation, specialization and ring size for the replacement to be manufactured. Anyone in the Halifax area can visit the university campus from 9 am to 4:30 pm every week day in order to submit a request for ring replacement. Dalhousie University has a procedure for a remote replacement, as well. If you’re interested in a remote replacement, you’ll have to provide information about your address, year of graduation and ring size. The information should be included in an official letter to the university’s campus address. The fee for an iron ring replacement is 25 dollars. It’s also possible to pick the Dalhousie University iron ring at another location. More information about the possibilities is provided on the university’s official site. Haven’t seen the name of your university in this list? You can benefit from the following list of contacts and remote iron ring replacement opportunities in order to have the size of your ring changed or to request a new one because of a loss.